Defense Minister Moshe Ya'alon on Sunday visited towns in Judea and Samaria, praising residents and expounding on their importance. Defense Minister Moshe Ya'alon on Sunday visited towns in Judea and Samaria, including Har Bracha, Eli, and Beit El. He met with residents and spoke with community leaders, while sampling the Sukkot hospitality of families in the towns. 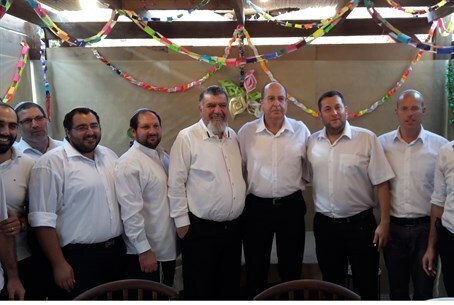 Among those Ya'alon visited were Yoni Yisraeli, chairman of the Har Bracha local secretary and a Likud activist, Koby Eliraz, chairman of the Har Bracha council, and Har Bracha local authority head Shai Alon. On his visit to Eli, Ya'lon stressed the same theme. “I have visited Eli many times over the years, meeting students in the pre-military academy. I am always amazed at the bravery and determination of the residents. I am happy to see how the town has developed and grown. This is a subject close to my heart,” he added.